Indie Retro News: Athanor 2 - The Legend Of The Birdmen - A new adventure game coming to the Atari ST and Amiga! Athanor 2 - The Legend Of The Birdmen - A new adventure game coming to the Atari ST and Amiga! If you're bored of hearing about action games and platformers then listen up, as we've just found out Safar Games will be bringing the text based adventure game ' Athanor 2 - The Legend of the Birdmen ' , to the Atari ST and Commodore Amiga. 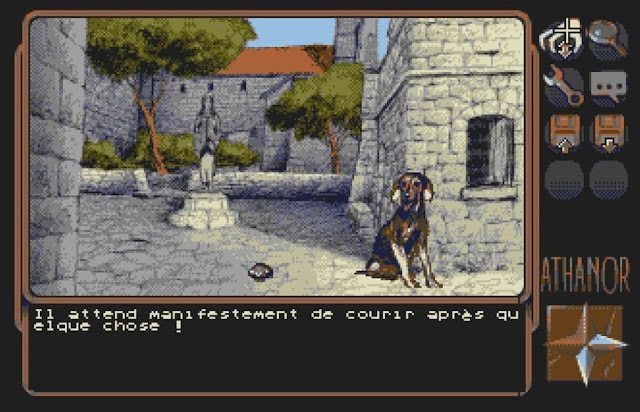 This game that is currently being shown in French, is the sequel to the 2015-2016 game 'Athanor' that was also released on the Amstrad CPC, ORIC and yes even the C64. Although the preview footage above is currently in French and previewed on the Atari ST ( Amiga should be very similar ). Athanor 2 will not only feature a typical 80's style North, South, East command interface of adventure games of old, but from what we can tell unlike the first game will also feature full mouse control and enriched dialogues and phases of gameplay. As for the team behind this upcoming game, they are....François Gutherz (Atari ST Graphs), Angel Bautista (Illustrations) and Hervé Monchatre (Music).